Ah...summer is so sweet, isn't it? Cookouts with kids running wild, fresh veggie salads and sweet watermelon dripping down your chin! Does it get any better? I think not! We recently had one of these awesome and sweet summer days. 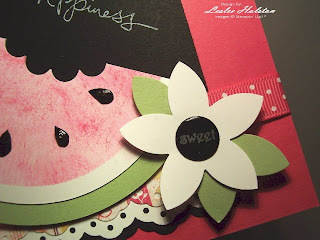 And when I sat down to start my swap cards for an upline meeting, all I could think of is that I wished I had some more of that sweet watermelon! So...I grabbed my Circle Scissor Plus and set out to make my paper version of that sweet watermelon. Can't you just taste it? Um...makes my mouth water! Using my Circle Scissor Plus, I cut out a circle in Whisper White, and then a circle slightly larger in Certainly Celery. I used a scratch piece of paper and cut a circle just smaller than the Whisper White. I used this as a template to reverse mask the white circle. In the template, I sponged on Melon Mambo (the watermelon flesh). The bite is created with the Scallop Circle punch. The seeds were hand cut out of scrap Basic Black, adhered with 2-way Glue Pen and then covered with Crystal Effects for visual dimension (it's really awesome irl). The sentiments in Basic Black Craft ink are both from the Teeny Tiny Wishes set (can't get enough of this set...I can't get it off my desk). 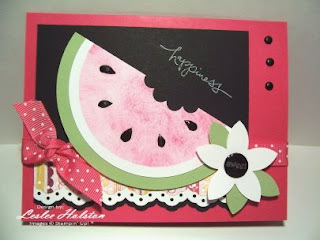 I used the Eyelet Border punch on the panel of Basic Black, Whisper White and a strip of Razzleberry Lemonade DSP. The Melon Mambo Polka Dot ribbon is wrapped just above the DSP strip and it is all adhered to the beautiful Melon Mambo card base. I love how this card turned out. I did fifteen of these and the toughest part was the seeds and waiting for the Crystal Effects to dry. To do just one really takes no time at all. Adam really wanted me to leave the Whisper White panel off and mount the watermelon right onto the Basic Black. 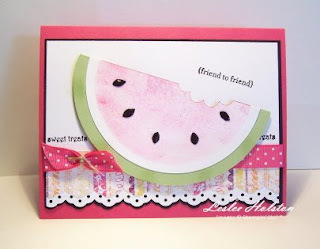 While I had the supplies all out and some extra watermelon slices on my desk, I made him this card. The C.E. really makes it pop! Do ya like it? I really like this one!! Someone really special is getting this card!! Thanks for stopping in today! May you find inspiration in life's sweet things too! Check back soon...I just got my order of new goodies and I'll be playing with it all over the weekend. I've already made a masculine card that I post first. I can't wait to put what's in my head onto paper!!! Been dreaming about this for weeks now! See you soon! I love all three cards! Makes me crave watermelon. 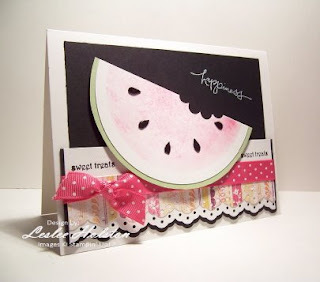 Leslee your card layouts are SO sweet! I LOVE the fun design you created three different ways!